We'll make use of a few functions within NumPy, a workhorse to do the computational heavy-lifting, and Matplotlib, a plotting library. 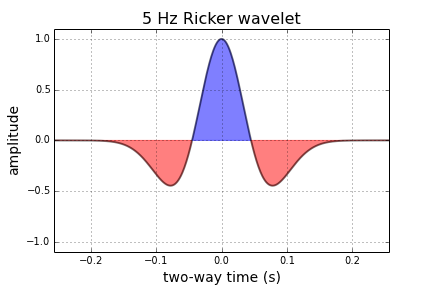 Here the function needs 3 input parameters; frequency, f, the length of time over which we want it to be defined, and the sample rate of the signal, dt. 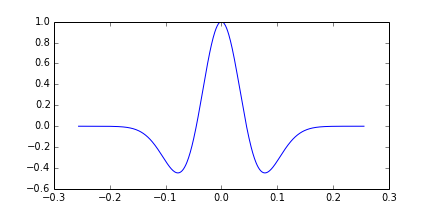 Calling the function returns two arrays, the time axis t, and the value of the function, y. Next up, we'll make this wavelet interact with a model of the earth using some math. Let me know if you get this up and running on your own. 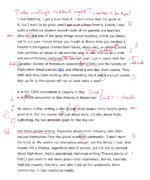 Marked-up copy — effective copy editing is a useful skill for all scientists that writeI love teaching. I get a buzz from it. I don't know that I'm great at it, but I want to be great. As a student, I think I was quite reflective—both of my parents were teachers—and one of the great things about teaching is that you finally get to put your money where your mouth is. Every time you berated a teacher's boringness (behind their backs, obviously), or whined about how pointless an essay or lab exercise was (to your buddies), is now held up as a vivid and uncomfortable challenge. Get more people writing. Especially people from industry, who often excuse themselves from the global scientific community. 'I don't have the time' or 'My work's not interesting enough' are the things I hear. And maybe I'm a shallow, superficial kind of person, but I'm not so worried about high-brow, highly specialized, technical writing. There's plenty of that. I just want to see more grass-roots experience, stories, tutorials, field trip reports, how-to's, and what-I-did-at-the-weekend's. More community, in less traditional media. Get people thinking about good style. Style has two aspects: the qualitative (what we might call interestingness) and the quantitative (correctness). I don't claim to be the world's greatest writer myself, but I know what gets me good feedback in my work, and I have an eye for detail (did you notice the extra space back there? I did). I think there are two insidious notions out there about writing: science is serious business, and 'nit-picky' detail is not all that important. Both of these notions are nonsense. If you were to take a writing skills course like this, what would you want to do or see? If you've done a course like this before and loved it (or not! ), what can I learn from it? Apologies to Jon Agee for the title; his poem Rotten Writing, in his book Orangutan Tongs was the inspiration.